Ahead of the ongoing CES 2019, Taiwanese conglomerate ASUS announced two traditional laptops, a two-in-one laptop and a tablet as part of its Chromebook Education series. ASUS claimed that the new Chromebooks are rugged and very easy to repair at the same time. ASUS took to the stage once again at the event to announce the Chromebook Flip C434. The newest offering flaunts premium metal chassis and an edge-to-edge display as its highlights. The latest Chromebook Flip C434 is a hybrid notebook and offers three modes – laptop, table and tent. The all metal construction of the laptop features aluminium with brushed metal finish on the lid. The Chrome OS-powered laptop is just 15.5mm thin and weigh around 1.5kg. ASUS claims that the 14-inch full HD touchscreen on the Flip C434 fits into the frame of a 13-inch display thanks to the NanoEdge display technology. The new laptop has 5mm bezels on the sides and features a front facing camera on the top bezel. ASUS has equipped the convertible with a full-sized keyboard with 1.4mm of key travel and backlighting. Coming to the spec sheet of the notebook, the ASUS Chromebook Flip C434 gets an Intel Core i7-8500Y, Intel Core i5-8200Y, and Intel Core M3-8100Y options. The laptop can be configured with up to 8GB of RAM and 128GB of internal storage. It boots the Chrome OS out of the box and supports Android apps. In terms of ports and connectivity, Flip C434 flaunts a microSD card slot, two USB-C port with Thunderbolt for charging the 48Wh battery, USB-A, and headphone jack. 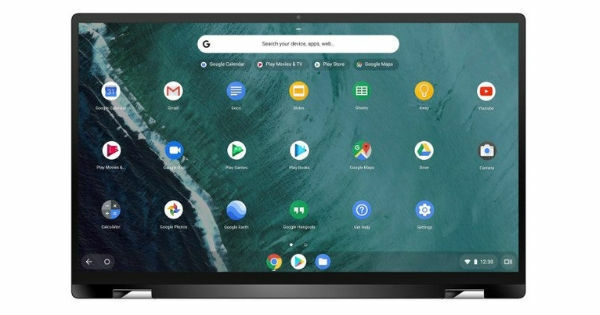 ASUS has announced that the Chromebook Flip C434 will be launched globally in the coming months. The brand also kept the pricing of the new offering under wraps, which will be revealed closer to the launch date.